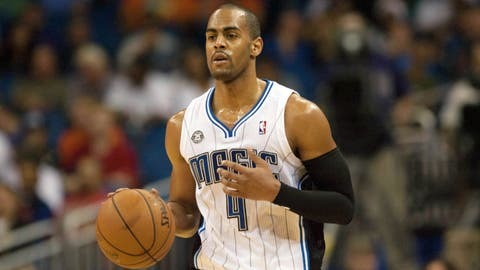 Orlando's Arron Afflalo will be trying to get on track at Portland. The shooting guard has scored 13.8 points per game -- 7.1 below his season average -- and has missed 13 of 15 3-point attempts during the Magic's four-game losing streak. The Portland Trail Blazers were one of the league’s biggest surprises during their red-hot start, though now they’re trying to overcome their worst stretch of the season. They appear to have a good opportunity to get on another roll as they open a homestand against struggling Eastern Conference opponents. Portland will try to avoid its fifth loss in seven games while dealing the visiting Orlando Magic their 11th straight loss versus the West on Wednesday night. The Blazers (26-9) jumped out to a 24-5 start and held the NBA’s best record following an impressive 116-112 overtime win over the Los Angeles Clippers on Dec. 26. Since then, however, Portland has gone 2-4 following Tuesday’s 123-119 loss at Sacramento. Damian Lillard finished with a career-high 41 points and LaMarcus Aldridge added 24 as the Blazers nearly rallied back from a 19-point fourth-quarter deficit. "We just need to be more consistent," said Lillard, who scored 26 of Portland’s 46 in the final 12 minutes. "But when it came down to it we still had a chance to win the game." DeMarcus Cousins exploited Portland’s weak interior defense on the way to 35 points. The Blazers rank near the bottom of the league with an average of 49.4 points allowed in the paint, and they’ve given up 54.0 over their last six despite 11 blocks from Aldridge. Portland, however, won’t have to contend with one of Orlando’s top interior scorers in the opener of a three-game homestand that continues Saturday against Boston (13-22) and Jan. 15 versus Cleveland (12-23). Nikola Vucevic is expected to miss some time after suffering a hard fall in Monday’s 101-81 loss to the Los Angeles Clippers at Staples Center in the opener of a five-game western trip. The 7-foot center totaled 34 points and 32 rebounds to help Orlando earn a split of last season’s series with the Blazers. "He’s already been diagnosed with a concussion, so he’ll enter the concussion protocol and I’ll leave it in the hands of the doctors now," said coach Jacque Vaughn, whose club has dropped 11 of 15. The last-place Magic (10-24) are looking to avoid their fifth straight loss and beat a team from the West for the first time since a 98-90 home win over the Clippers on Nov. 6. Orlando hasn’t been able to generate much scoring during its skid, averaging 84.3 points on 38.3 percent shooting. Arron Afflalo has scored 13.8 per game — 7.1 below his season average — and missed 13 of 15 3-point attempts over that span, while Jameer Nelson and Tobias Harris combined for five points on 2-of-18 shooting in Monday’s loss. With Afflalo scoring 24 and Nelson adding 21, Orlando nearly escaped with a win before falling 125-119 in overtime in the most recent meeting in Portland on Jan. 7, 2013. Aldridge led the way with 27 points and Wesley Matthews had 24 and a dunk that all but secured the victory with less than a minute remaining. Matthews has averaged 20.3 points with eight 3s while shooting 55.6 percent in his last three at home against the Magic. Although Lillard ranks among the NBA’s leaders with 116 3-pointers after hitting seven in Tuesday’s loss, he’s missed all 14 of his attempts in two career meetings. He went 1 for 16 from the field for four points in a 110-104 loss in Orlando on Feb. 10. Since opening the season with 11 straight victories at home, the Blazers have lost two of three at Moda Center. They’ve won three of four there against the Magic.